Takamine started as a small family business based in Japan, but since then it has become one of the leading manufacturers of acoustic guitar in the world. The History of Takamine guitars can be dated back as early as 1962 and the brand went global during the mid-1970s, when Takamine tapped into the growing popularity of guitar in Japan and around the world. They have been credited with making several technological advances in the development of acoustic guitars, earning worldwide recognition for the development of under-saddle Palathetic™ pickup for their acoustic-electric guitars. As the acoustic guitar rose in popularity as the dominant instrument in popular music during the 1960s, the same wave occurred in Japan. Takamine started as a small instrument workshop at the base of Mount Takamine in Gifu, Japan. It was not until 1968, however, when the company began to grow into the Corporation globally that it is today. This company started in 1959 as a humble family business located at the foot of Mount Takamine, in the center of the village of Sakashita. In 1962 they took the name of its location (Takamine) and began the long journey to what it is today. In Japan, guitar performance became very popular in the 60s, which helped Takamine to grow and implement new methods to satisfy its customers. That local success enabled Takamine to expand internationally in 1975, showing its qualities to the rest of the world. Several years after its creation, Takamine set out to grow its distribution and reach more artists and designers. Masa Hirade, a talented luthier who was well known at the time, joined Takamine in 1968 to help improve the quality of their guitars. Originally he pioneered many improvements in Takamine’s line, particularly their classical guitars. Soon, under Hirade’s direction, Takamine was able to expand its shipment abroad in 1975, and grow into a global company. Sometime in the mid-1970s, Hirade became President of the company. Determined to release Takamine’s name on a global brand, he partnered with Kaman Music Corporation based in the United States. It started an international export operation that began in 1975. At the same time that Takamine gained worldwide notoriety for his craftsmanship and excellence in acoustic guitar design, popular music encountered a problem. As concert halls grew in size, so did the sounds of the musicians playing on them. But artists and technicians alike found it difficult to recreate the sound of their acoustic guitars as they played through microphones on large speakers. Takamine made a breakthrough in technology to solve this problem, they developed the under-saddle Palathetic™ pickup in the mid to late 1970s. The key to the development of technology was that the pickup was made up of six electric transducers, one for each string, and the vibrations of the pulsed string enter directly from the bridge. Takamine released their first acoustic electric-guitar in 1979 – the PT-007S. Not only had it effectively amplified the acoustic sound, but it minimized the chain between noise and feedback to produce the cleanest and brightest acoustic guitar ever played through an amplifier. The Palathetic picking system has helped make Takamine’s acoustic-electric guitars some of the best available. Made known in 1978, the Takamine guitars were soon backed by such prominent artists as Bruce Springsteen and Jackson Browne. The Eagles also played a Takamine 12 string electric-acoustic as part of their classic, “Hotel California”. Takamine had developed acoustic guitar technology with the invention of the first-ever single-unit preamplifier, which allowed interchangeable amps during performances. This latest breakthrough gained even more recognition for Takamine, who today remains one of the top acoustic guitar makers in the world. For half a century now, Takamine has been proudly dedicated to the art of creating quality guitars. Its long career in innovation and the continuous development of his art has placed them among the world elite of acoustic and acoustic-electric guitar manufacturers, with great designs of guitars and excellent quality, are the favorite of many guitarists worldwide. 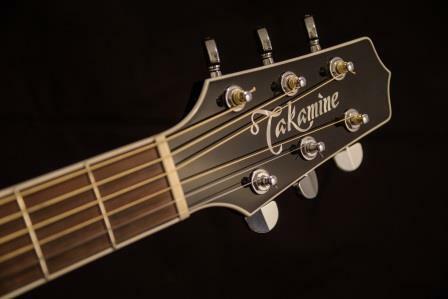 Innovations such as their Palathetic™ pickup that we have discussed above and others like their split saddle and pin-less bridges, help to make Takamine a unique guitar manufacturer, in addition to being a very good one. It will be interesting to see what further innovations Takamine will be able to bring into the world of guitars. Have you ever played a Takamine? Do you own one? Feel free to share your experiences with Takamine guitars in the comments section below.